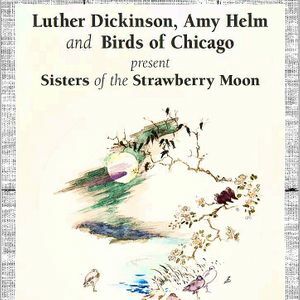 Like any good party, Luther Dickinson and Sisters of the Strawberry Moon’s debut album, ‘Solstice,’ comes complete with a great soundtrack and an impeccable guest list, one that boasts Amy Helm, Birds of Chicago, Amy LaVere, and Shardé Thomas among others. And like any good host, Dickinson manages to put the spotlight on his friends here, taking a step back from the microphone in order to focus his efforts behind the scenes and flex his considerable muscles as both a producer and a guitarist. The result is an album that stands apart in Dickinson’s extensive catalog, a collection that brings together some of the most captivating female voices in modern American roots music and filters each of their distinctive personalities through a singular vision of artistic community and musical exploration. Freedom has long been Dickinson’s sonic signature, both on the stage and in the studio. Growing up in Mississippi, he learned the power of artistic adventurousness firsthand from his father, who produced albums for Big Star and The Replacements in addition to recording with everyone from Bob Dylan and Aretha Franklin to Ronnie Hawkins and the Rolling Stones. Dickinson followed in his father’s footsteps, first earning a reputation as a fearsome session guitarist before breaking out internationally as a songwriter and performer with North Mississippi Allstars, the band he launched with his brother Cody in the late 90’s. The group earned a GRAMMY nomination for their critically acclaimed debut, ‘Shake Hands With Shorty,’ and went on to release a slew of similarly celebrated studio and live albums over the next two decades. NPR’s Mountain Stagecalled the band “modern-day torchbearers for the distinct, funky, Hill Country blues associated with their native state,” while theNY Timespraised Dickinson as “an impressive player in the Southern guitar-hero mold,” and Rolling Stonehailed the group’s “­boogie blues and fuzzed-out funk.” The band toured with superstars like Robert Plant and Dave Matthews in addition to slaying festival stages from Bonnaroo to Newport Folk, and they topped the BillboardBlues Albums chart three separate times, most recently with 2017’s ‘Prayer For Peace.’ Dickinson’s restlessness and versatility, meanwhile, fueled an impressive solo career and landed him stints playing with the likes of John Hiatt and The Black Crowes in addition to studio work with Patty Griffin, Devon Allman, Seasick Steve, and more. That same versatility lies at the heart of ‘Solstice,’ a wide-ranging collection that harkens back to the era of the traveling revue, when a rotating cast of entertainers would take turns fronting a house band for a series of dynamic and unpredictable performances. Capturing that brand of authentic spontaneity meant taking a very hands-off approach in the studio, and Dickinson was careful to leave space for each song to develop organically. With nearly all of the album’s vocals recorded live in just one or two takes, there was no room for overthinking or second-guessing, only instinct and intuition. Commitment to living in the moment was key to keeping the album as cohesive as it is, no small task considering the broad array of songs and voices it encompasses. The record opens with a delicate take on Birds of Chicago’s “Superlover,” a gentle meditation on the power of human connection that’s woven together with meandering fiddle and fingerpicked guitar. It’s an ideal entry point for the album: contemporary but timeless, deeply personal but broadly universal, and fueled by a hypnotic feminine energy. It’s tempting to read a political statement into the supremacy of the female voice on this collection—even the simple act of releasing an album built upon the power of community and collaboration in these deeply divided times manages to feel quietly radical in its own way—but these are not songs of protest or discontent. These are songs of hope, of faith, of promise. These are songs that believe in our better angels and insist that dawn is coming even in the darkest of nights. “Build your hopes on things eternal,” Mississippi gospel legends The Como Mamas instruct on the old-time spiritual “Hold To His Hand,” delivering what could be a mission statement for the entire album in a single, stirring line. Thomas’s funky “We Made It” celebrates endurance and survival in the face of heartbreak and pain, while the soulful “Til It’s Gone” finds Birds of Chicago’s Allison Russell living for the present (“God bless this beautiful morning til it’s gone,” she sings), and the T Bone Burnett/Bob Neuwirth-penned “Like A Songbird That Has Fallen” is a tender ode to redemption and second chances in Helm’s capable hands. LaVere, meanwhile, offers up a sultry dose of Memphis romance on “The Night Is Still Young” and spins a charming folk allegory on the bouncing “Cricket (At Night I Can Fly),” both of which feature beautiful guitar work from her husband and musical partner, Will Sexton. Varied as the performances on the album are, the songs are all stitched together elegantly by Dickinson’s subtly sophisticated production and the band’s peerless musicianship. Thomas’s drumming offers an R&B counterpoint to Russell’s legato clarinet, and LaVere’s deep grooves on the upright bass prove to be an ideal bedrock for Dickinson’s bluesy guitar work. While most of the album was recorded live in the studio, the band did invite a few special guests to contribute additional parts, including fiddler Lillie Mae Rische (Jack White, Jim Lauderdale), organist Rev. Charles Hodges (Al Green, Willie Mitchell), and GRAMMY-winning artist/producer Alvin Youngblood Hart. More than just an artifact, though, ‘Solistice’ is a living, breathing monument to the power of collaboration, a timely reminder of our shared humanity and the ties that bind us. It’s a party, after all, and like any good party, everyone’s welcome.